Molecular gastronomy includes the study of how different cooking temperatures affect eggs, their viscosity, surface tension, and different ways of introducing air into them. A molecular gastronomy rendition of eggs Benedict served by wd~50 in New York City. The cubes are deep-fried Hollandaise sauce. Molecular gastronomy is a subdiscipline of food science that seeks to investigate the physical and chemical transformations of ingredients that occur in cooking. Its program includes three areas, as cooking was recognized to have three components: social, artistic, and technical. Molecular cuisine is a modern style of cooking, and takes advantage of many technical innovations from the scientific disciplines. The term "molecular gastronomy" was coined in 1988 by late Oxford physicist Nicholas Kurti and the French INRA chemist Hervé This. Some chefs associated with the term choose to reject its use. Gibbs – infusing vanilla pods in egg white with sugar, adding olive oil and then microwave cooking. Named after physicist Josiah Willard Gibbs (1839–1903). 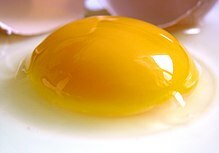 Vauquelin – using orange juice or cranberry juice with added sugar when whipping eggs to increase the viscosity and to stabilize the foam, and then microwave cooking. Named after Nicolas Vauquelin (1763–1829), one of Lavoisier's teachers. Baumé – soaking a whole egg for a month in alcohol to create a coagulated egg. Named after the French chemist Antoine Baumé (1728–1804). French chemist and cook Hervé This, known as "The Father of Molecular Gastronomy"
Heston Blumenthal dislikes the term 'molecular gastronomy', believing it makes the practice sound "complicated" and "elitist." There are many branches of food science that study different aspects of food, such as safety, microbiology, preservation, chemistry, engineering and physics. Until the advent of molecular gastronomy, there was no branch dedicated to studying the chemical processes of cooking in the home and in restaurants. Food science has primarily been concerned with industrial food production and, while the disciplines may overlap, they are considered separate areas of investigation. 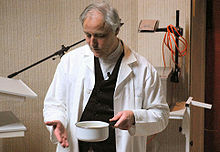 The creation of the discipline of molecular gastronomy was intended to bring together what had previously been fragmented and isolated investigations into the chemical and physical processes of cooking into an organized discipline within food science, to address what the other disciplines within food science either do not cover, or cover in a manner intended for scientists rather than cooks. The term "molecular and physical gastronomy" was coined in 1988 by Hungarian physicist Nicholas Kurti and French physical chemist Hervé This. In 1992, it became the title for a set of workshops held in Erice, Italy (originally titled "Science and Gastronomy") that brought together scientists and professional cooks for discussions about the science behind traditional cooking preparations. Eventually, the shortened term "molecular gastronomy" became the name of the approach, based on exploring the science behind traditional cooking methods. Kurti and This considered the creation of a formal discipline around the subjects discussed in the meetings. After Kurti's death in 1998, the name of the Erice workshops was changed by This to "The International Workshop on Molecular Gastronomy 'N. Kurti'". This remained the sole director of the subsequent workshops from 1999, and continued his research in the field of molecular gastronomy at the Inra-AgroParisTech International Centre for Molecular Gastronomy, in charge of organizing the international meetings. The idea of using techniques developed in chemistry to study food is not a new one, for instance the discipline of food science has existed for many years. Kurti and This acknowledged this fact and though they decided that a new, organized and specific discipline should be created within food science that investigated the processes in regular cooking (as food science was primarily concerned with the nutritional properties of food and developing methods to process food on an industrial scale), there are several notable examples throughout history of investigations into the science of everyday cooking recorded as far as back to 18th century. The concept of molecular gastronomy was perhaps presaged by Marie-Antoine Carême, one of the most famous French chefs, who said in the early 19th century that when making a food stock "the broth must come to a boil very slowly, otherwise the albumin coagulates, hardens; the water, not having time to penetrate the meat, prevents the gelatinous part of the osmazome from detaching itself." The book includes chapters such as "The Chemistry of Milk", "The Chemistry of Baking Powders and Their Use in Baking", "The Chemistry of Vegetable Cookery" and "Determination of Hydrogen Ion Concentration" and contains numerous illustrations of lab experiments including a Distillation Apparatus for Vegetable Samples and a Pipette for Determining the Relative Viscosity of Pectin Solutions. The professors had previously published The Hows and Whys of Cooking in 1928. In 1932, Belle Lowe, then the professor of Food and Nutrition at Iowa State College, published a book titled Experimental Cookery: From The Chemical And Physical Standpoint which became a standard textbook for home economics courses across the United States. The book is an exhaustively researched look into the science of everyday cooking referencing hundreds of sources and including many experiments. At a length of over 600 pages with section titles such as "The Relation Of Cookery To Colloidal Chemistry", "Coagulation Of Proteins", "The Factors Affecting The Viscosity Of Cream And Ice Cream", "Syneresis", "Hydrolysis Of Collagen" and "Changes In Cooked Meat And The Cooking Of Meat", the volume rivals or exceeds the scope of many other books on the subject, at a much earlier date. Though rarely credited, the origins of the Erice workshops (originally entitled "Science and Gastronomy") can be traced back to cooking teacher Elizabeth Cawdry Thomas, who studied at Le Cordon Bleu in London and ran a cooking school in Berkeley, California. The one-time wife of a physicist, Thomas had many friends in the scientific community and an interest in the science of cooking. In 1988, while attending a meeting at the Ettore Majorana Center for Scientific Culture in Erice, Thomas had a conversation with Professor Ugo Valdrè of the University of Bologna, who agreed with her that the science of cooking was an undervalued subject, and encouraged Kurti to organize a workshop at the Ettore Majorana Center. However nothing happened until Kurti met Hervé This: both approached the director of the Ettore Majorana center, physicist Antonino Zichichi who liked the idea. They invited the food science writer Harold McGee to join them as invited co-director of the first workshops in 1992. Benjamin Thompson, Count Rumford (1753–1814) was one of the early pioneers in the science of food & cooking. Kurti demonstrated making meringue in a vacuum chamber, the cooking of sausages by connecting them across a car battery, the digestion of protein by fresh pineapple juice, and a reverse baked alaska—hot inside, cold outside—cooked in a microwave oven. Kurti was also an advocate of low temperature cooking, repeating 18th century experiments by British scientist Benjamin Thompson by leaving a 2 kg (4.4 lb) lamb joint in an oven at 80 °C (176 °F). After 8.5 hours, both the inside and outside temperature of the lamb joint were around 75 °C (167 °F), and the meat was tender and juicy. With his wife, Giana Kurti, Nicholas Kurti edited an anthology on food and science by fellows and foreign members of the Royal Society. Hervé This started collecting "culinary precisions" (old kitchen wives' tales and cooking tricks) the 24th of March 1980, and started testing these precisions to see which held up; his collection eventually numbered some 25,000. In 1995, he received a PhD in Physical Chemistry of Materials, for which he wrote his thesis on "La gastronomie moléculaire et physique" (molecular and physical gastronomy). He served as an adviser to the French minister of education, lectured internationally, and was invited to join the lab of Nobel-winning molecular chemist Jean-Marie Lehn. This has published several books in French, four of which have been translated into English, including Molecular Gastronomy: Exploring the Science of Flavor, Kitchen Mysteries: Revealing the Science of Cooking, Cooking: The Quintessential Art, and Building a Meal: From Molecular Gastronomy to Culinary Constructivism. He currently publishes a series of essays in French, and hosts free monthly seminars on molecular gastronomy at the INRA in France. He gives free and public seminars on molecular gastronomy any month, and once a year he gives a public and free course on molecular gastronomy. Hervé This also authors a website and a pair of blogs on the subject in French, and publishes monthly collaborations with French chef Pierre Gagnaire on Gagnaire's website. This later recognized points 3, 4, and 5 as being not entirely scientific endeavours (more application of technology and educational), and has revised the list. How our enjoyment of food is affected by other influences, our environment, our mood, how it is presented, who prepares it, etc. Grant Achatz (photo: plating a dish at Alinea) is the leading American chef in molecular gastronomy shown here plating the dessert pictured above. In the late 1990s and early 2000s, the term started to be used to describe a new style of cooking in which some chefs began to explore new possibilities in the kitchen by embracing science, research, technological advances in equipment and various natural gums and hydrocolloids produced by the commercial food processing industry. It has since been used to describe the food and cooking of a number of famous chefs, though many of them do not accept the term as a description of their style of cooking. Chefs who are often associated with molecular gastronomy because of their embrace of science include Heston Blumenthal, Grant Achatz, Ferran Adrià, José Andrés, Sat Bains, Richard Blais, Marcel Vigneron, Sean Brock, Homaro Cantu, Michael Carlson, Wylie Dufresne, Pierre Gagnaire, Adam Melonas, Kevin Sousa, and Laurent Gras. Despite their central role in the popularisation of science-based cuisine, both Adria and Blumenthal have expressed their frustration with the common mis-classification of their food and cooking as "molecular gastronomy", On 10 December 2006 Blumenthal and Harold McGee published a 'Statement on the "New Cookery" in the Observer in order to summarise what they saw as the central tenets of modern cuisine. Ferran Adria of El Bulli and Thomas Keller of the French Laundry and Per Se signed up to this and together released a joint statement in 2006 clarifying their approach to cooking, stating that the term "molecular gastronomy" was coined in 1992 for a single workshop that did not influence them, and that the term does not describe any style of cooking. In February 2011, Nathan Myhrvold published the Modernist Cuisine, which led many chefs to further classify molecular gastronomy versus modernist cuisine. Myhrvold believes that his cooking style should not be called molecular gastronomy. The term molecular gastronomy was originally intended to refer only to the scientific investigation of cooking, though it has been adopted by a number of people and applied to cooking itself or to describe a style of cuisine. Ferran Adrià of El Bulli, prefers the term 'deconstructivist' to describe his style of cooking. No singular name has ever been applied in consensus, and the term "molecular gastronomy" continues to be used often as a blanket term to refer to any and all of these things—particularly in the media. Ferran Adrià hates the term "molecular gastronomy" and prefers 'deconstructivist' to describe his style of cooking. A 2006 open letter by Ferran Adria, Heston Blumenthal, Thomas Keller and Harold McGee published in The Times used no specific term, referring only to "a new approach to cooking" and "our cooking". ^ Gadsby, Patricia (2006-02-20). "Cooking For Eggheads". Discover Magazine. Retrieved 2010-09-08. ^ "Eggs". Khymos.org. 2009-04-08. Retrieved 2010-09-08. ^ a b Kuh, Patric (January 1, 2005). "Proving It: Taking kitchen science to a whole new (molecular) level, Hervé This is changing the way France—and the world—cooks". gourmet.com. ^ a b c d "Harold McGee, Curious Cook: Modern Cooking, Science, and the Erice Workshops on Molecular and Physical Gastronomy". Curiouscook.com. Archived from the original on 2010-10-24. Retrieved 2010-09-08. 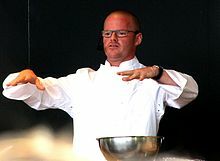 ^ a b c d Heston Blumenthal (2006-12-10). "Statement on the New Cookery - Guardian Observer". London: Observer.guardian.co.uk. Retrieved 2010-09-08. ^ McGrane, Sally (2007-07-24). "The Father of Molecular Gastronomy Whips Up a New Formula". wired.com. Retrieved 2011-08-03. ^ "'Molecular gastronomy is dead.' Heston speaks out". The Guardian. London. Retrieved 4 May 2010. ^ a b "INRA France Abstract on Molecular Gastronomy". Inra.fr. Archived from the original on October 15, 2009. Retrieved 2010-09-08. ^ Kroger, Manfred (2006-08-02). "What's All This We Hear about Molecular Gastronomy?". Comprehensive Reviews in Food Science and Food Safety. 5 (3): 48–50. doi:10.1111/j.1541-4337.2006.00003.x. ^ "1999 INTERNATIONAL WORKSHOP ON MOLECULAR AND PHYSICAL GASTRONOMY - EMFCSC". Ccsem.infn.it. 1999-05-10. Retrieved 2010-09-08. ^ a b c "History of Molecular Gastronomy". Khymos.org. 2008-05-13. Retrieved 2010-09-08. ^ "Notes on the International Workshop on Molecular Gastronomy 2004". Egullet. Retrieved 2010-09-08. ^ Sally McGrane (2007-07-24). "The Father of Molecular Gastronomy Whips Up a New Formula - Wired Magazine". Wired.com. Retrieved 2010-09-08. ^ "Hervé This Blog". Hervethis.blogspot.com. Retrieved 2010-09-08. ^ "Hervé This Blog 2 | Gastronomie Moléculaire". Gastronomie-moleculaire.blogspot.com. 2004-02-26. Retrieved 2010-09-08. ^ "Pierre Gagnaire Website - Art et Science". Pierre-gagnaire.com. Archived from the original on 2010-11-26. Retrieved 2010-09-08. ^ a b "Definitions of Molecular Gastronomy". Khymos.org. 2010-08-09. Retrieved 2010-09-08. ^ "Peter Barham on Molecular Gastronomy – Discovery Channel". Discoverychannel.co.uk. Retrieved 2010-09-08. ^ "Molecular Gastronomy Resources". A La Cuisine!. 2004-11-20. Retrieved 2010-09-08. ^ Dietmar Hölscher. "nova kuirejo - SOSA Ingredients - Category Molecular Gastronomy". Mcc-shop.com. Retrieved 2010-09-08. ^ Heston, Blumenthal (2008). The Fat Duck Cookbook. p. 124. ISBN 978-0-7475-8369-1. ^ "Zagat Buzz Blog: Chefs Weigh In: "Modernist Cuisine" or "Molecular Gastronomy"? March 24, 2011". Zagat.com. 2011-03-24. Retrieved 2011-03-30. ^ a b c "'Molecular gastronomy is dead.' Heston speaks out | Compare and buy | The Observer". London: Observer.guardian.co.uk. 2011-02-09. Retrieved 2011-03-30. ^ "bacon decorated with butterscotch and dehydrated apple, served threaded on a horizontal wire". ^ "Bite the Antenna - Gear - Food News". CHOW. 2006-11-09. Retrieved 2011-03-30. ^ "You're Mispronouncing "Achatz" - Feature - Food News". CHOW. 2007-01-12. Retrieved 2011-03-30. 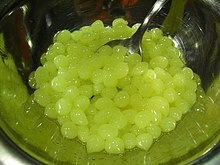 ^ "Molecular Gastronomy: New Cooking Techniques with Familiar Food Flavors". Chef 2 Chef. Retrieved 2011-03-30. ^ "Food Technology Magazine Article by Herve This 12/2008" (PDF). Members.ift.org. Retrieved 2010-09-08. ^ a b c Toomey, Christine (28 March 2010). "What Ferran Adrià is cooking up after El Bulli". The Times. London. Retrieved 10 October 2010. ^ a b Abend, Lisa (March 26, 2008). "Fish Foam and Spherified Mango Juice: Will Spanish avant-garde cuisine stand the test of time?". slate.com. Retrieved 2011-08-03. ^ "Next Culinary Movement - Culinary Constructivism". Movable Feast. 2004-11-17. Retrieved 2012-02-16. ^ MOSKIN, JULIA (June 14, 2011). "After El Bulli, Spain Looks Forward". nytimes.com. ^ "modernistcuisine.com". modernistcuisine.com. Retrieved 2012-02-16. ^ "Joan, Jordi and Josep Roca at Restaurant Ikarus". Hangar-7.com. Retrieved 2012-02-16. ^ "Adam Melonas's Progressive cuisine Blog". Madrid Lab. Retrieved 2012-02-16. ^ Husband, Stuart (2 August 2012). 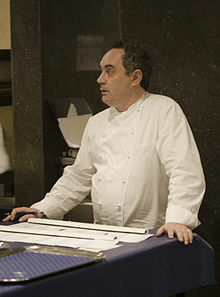 "What next for El Bulli mastermind Ferran Adrià?". The Telegraph. ^ KAMP, DAVID (2011-03-30). "Charlie Trotter, a Leader Left Behind". nytimes.com. ^ Preston, Matt (April 29, 2008). "The new frontier". Melbourne: theage.com.au. Retrieved 2011-08-03. Look up molecular gastronomy in Wiktionary, the free dictionary. Caporaso, Nicola, Diego Formisano (2016). Developments, applications, and trends of molecular gastronomy among food scientists and innovative chefs. Food Reviews International, 32(4), 417-435. McGee, Harold, The Curious Cook. North Point Press, Berkeley, 1990. McGee, Harold, On Food and Cooking: The Science and Lore of the Kitchen. Scribner, New York, 2004. ISBN 0-684-80001-2. This page was last edited on 19 March 2019, at 18:38 (UTC).